Start Your Day With A Hearty Breakfast..
1 serve of rolled oats made on either water or low fat milk. Cook for a couple of minutes. add: organic maple syrup (the real deal) Add: Cinnamon to taste A touch of low fat milk Enjoy! A great way to start the day. This recipe can also be used in Preparation/Detox phase simply replace the low fat milk with either almond or rice milk. Start Cooking Roughly bash the nuts and seeds in a mortar and pestle or pulse them in a food processor with a bowl blade. I like some fine and some chunky. Mix smashed nuts and seeds, oats, coconut and cinnamon. Now you have a choice: You can either mix it with the chopped cherries and apricots and decant it straight into airtight jars to toast as and when you want it, or you can spread it across a couple of large roasting trays and toast in a preheated oven at 180°C/350°F until nicely golden, stirring regularly. Let it cool then mix in the chopped cherries and apricots and tip into jars to await eating. if you want to toast it as and when you want it, I just put a dry frying pan on a medium heat ans add a handful of granola (roughly 50g) per person. Toast for 3 or so minutes, tossing often to bring out the roasted flavour and crispy texture, until lightly golden and smelling delicious. Stir in a good teaspoon of maple syrup per person and let it get sticky, then serve hot with cold milk or yogurt and fresh seasonal fruit, if you like. To Serve: maple syrup milk or low fat yogurt My suggestion is to buy a big batch of ingredients like the list given here, mix it all up and just grab a handful per person whenever you need it- it will last months. I love it served with fresh blueberries or pomegranate seeds. This recipe comes from Jamie Olivers “Jamie’s 15 Minute Meals” you can grab yourself a copy here. 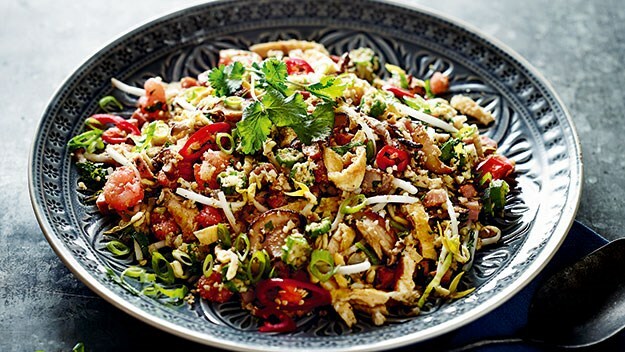 Prepare Quinoa a day ahead, store in an airtight container and refrigerate. Cook Quinoa according to directions but simply replace water with Chicken stock. Drain & allow to rest for 10-15minutes and then fluff gently with a fork. 2. Heat a medium frypan over medium heat, wilt spinach, season with salt & pepper. Transfer to a colander to drain any extra moisture. Chop coarsely and set aside. 5. Arrange quinoa in centre of bowl. Make a well in the middle. 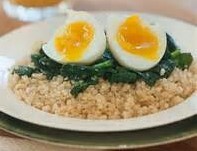 Pile spinach in well and top with poached egg(s) season with salt and pepper. Sprinkle over feta. Enjoy!! Heat oil in a heavy based pan. Stir in coriander and fennel seeds and onion. Cook for 2 minutes over low – med heat. Once onion has softened add all the other veg and stock. Bring to a slow simmer. Add water and chicken. Turn heat down and allow the chicken to poach in the stock. Season with salt and pepper. Once chicken is cooked through chop or pull apart into bite size pieces. A yummy healthy winter lunch. N.B You can use 1 litre of veg stock and eliminate the water. You can also add other herbs of your choice. 1 Pulse the cauliflower in a food processor until it resembles rice. 2 In a large frying pan or wok, fry the bacon over high heat until crispy. Remove and set aside. 3 In a large frying pan or wok, fry the bacon over high heat until crispy. Remove and set aside. 4 Heat the coconut oil in the pan over high heat, add the onion and garlic and cook for a few minutes, or until softened. Stir in the prawns, mushrooms and ginger and cook for another few minutes. Add the okra and Brussels sprouts and cook for 1 minute. Add the cauliflower and cook for 2–3 minutes, or until tender. Add bacon, egg, tamari, sprouts, spring onion, herbs and some salt and pepper and cook for 2 minutes, or until everything is heated through and well combined. 5 Serve with a splash of fish sauce and kimchi (Korean fermented cabbage), if desired. This recipe is from the Australian Womens Weekly website. Place all above ingredients on a large baking tray. Making sure to coat well with the olive oil. Roast in a slow- moderate oven for 30- 40mins or until soft. Place everything into a heavy based saucepan, add 1.25lit of organic vegetable stock & blitz until smooth. Heat gently and serve for a healthy lunch or dinner. Enjoy!! Cauliflower is a hearty veggie that we like to use as a replacement for rice or pasta or along with a medley of other veggies. 2. Chop cauliflower head into florets. 3. Place cauliflower into a baking dish. Add olive oil, turmeric, cumin and salt then mix together. 4. Cover baking dish with foil to keep florets from drying out and roast for about 35-40 min. Then, remove foil and cook for another 15 minutes. Copyright 2014. Black Fitness Today All rights reserved. Cerebellum Media Group, LLC. There are many health benefits associated with the powerful anti-inflammatory properties of these ingredients including – boosting immunity, skin cleanser, reducing nausea and motion sickness, to reduce blood pressure and migraines, eases menstrual cramps, reduces allergies and arthritis, helps ease a sore throat, clears phlegm and boosts metabolism. 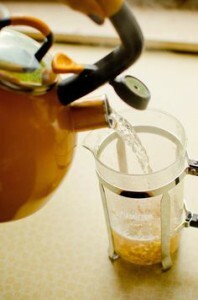 Method – Add all the ingredients into a tea pot of coffee plunger and pour boiling water on top – probably about 2 cups. Let it sit for 5-10 minutes to allow the spices to infuse the water. 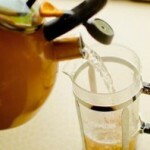 Pour and drink at a comfortable temperature. This recipe is my husbands favorite. He even takes extra to work for his work colleagues, they love it with Rye crackers around the lunch table or in a meeting. Drain chick peas. Blend chick peas, tahini and lemon juice together until smooth. Add crushed garlic, blend until mixed through, then add oil slowly until you reach your desired consistency. Serve with your favorite rice or Rye crackers, carrot, celery and Zucchini sticks are also yummy with Hummus for lunch. Use instead of butter or margarine. It keeps in the fridge for days. Tired and bored with constant dieting only to lose 500g a week? How does losing 500g a day sound? Well you can on The Rapid Fat Loss Program. Your Journey begins here....why wait another day, month or year.